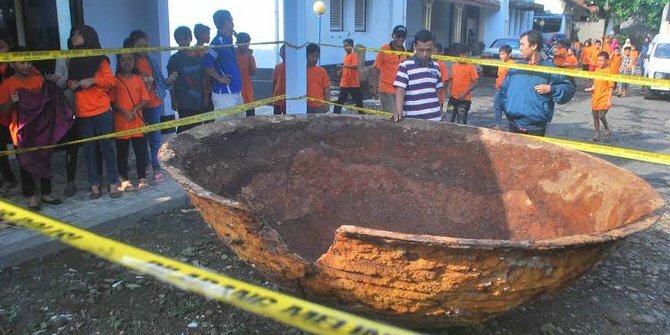 The Giant Frying Pan, which was unearthed in Central Java, has broken on the way to the museum. The bizarre artifact was discovered last month (April 2016) while builders were preparing to lay the foundation for an upcoming shop-house complex. Local officials are still unsure of the origins of the odd discovery. Giant Frying Pan discovered in Java, broken on the way to Museum. Source. The group attempted to lift the pan with the help of leather straps and a shovel. Unable to take the outstanding weight of the 1-ton frying pan, the straps gave way, sending the giant ancient pan crashing to the ground. The giant wok found in Central Java measures nearly 3 meters in diameter and weighs over a ton. 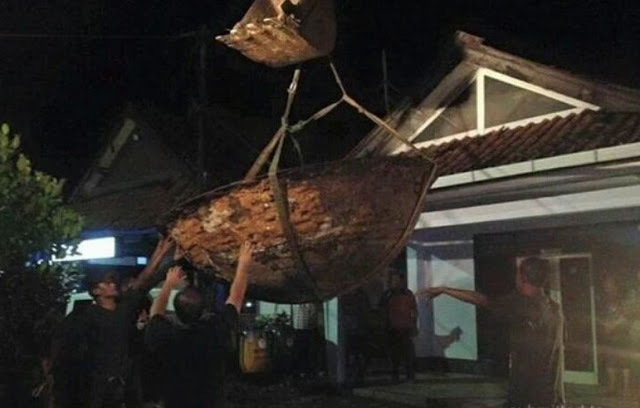 1-Ton Iron Pan is lifted with leather straps and a shovel. Source. Widodo Hadi Pranoto, the owner of the land where the pan was found, was deeply distressed at the damage of a possibly historical object. “I am very disappointed that the frying pan has broken,” he said. A triangular section of the pan measuring approximately 40 x 30 centimeters has broken off. Additionally, there is a crack of about half a meter along the base of the strange giant pan. Spectators held back by Police Tape to protect giant pan from further damage. Source. 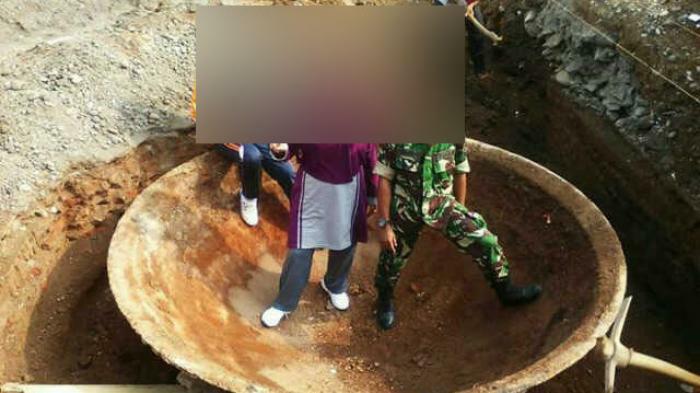 Spectators gathered immediately after the pan had fallen, to pose and take pictures with the oversized object. The police responded by immediately putting up a police-barrier so the ancient frying pan would not be touched or damaged further. Before being moved, the giant pan was trampled daily by hundreds of residents who flocked to the scene to take selfies. This likely played a role in weakening the pan, and leading to the damage of the possibly historical object. 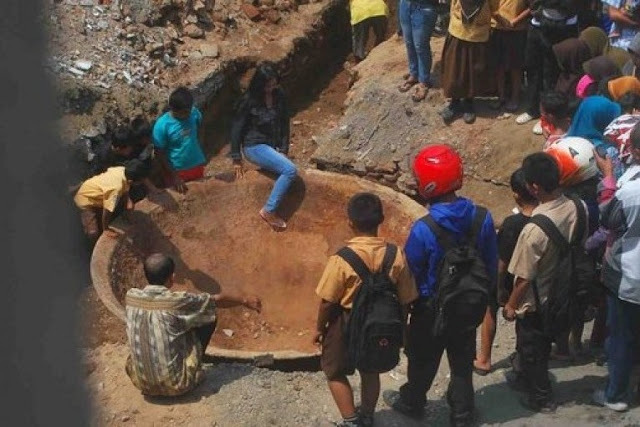 Spectators climb into ancient pan for a selfie. Source. Selfie in an ancient artifact. Source. 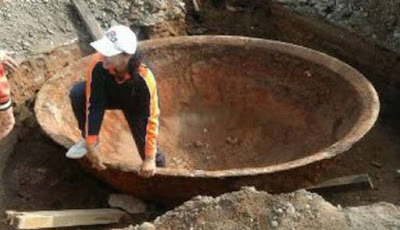 The Giant Frying Pan was originally discovered on Jalan MT Haryono, Kutoarjo District, Purworejo Regency, Central Java, Indonesia. Today, the giant wok and its fragments are securely held in the Keris Tosan Aji Museum in Purworejo. Despite being cracked and damaged, the ancient wok still draws the interest of the public around Central Java and Jogjakarta, who now visit the museum to observe this strange object.